The disastrous earthquake on 25th April caused widespread devastation in at least 12 districts of Nepal and some parts of Bharat. It is believed that more than 15000 people have been killed by the earthquake though there are opinions of higher number of casualties. 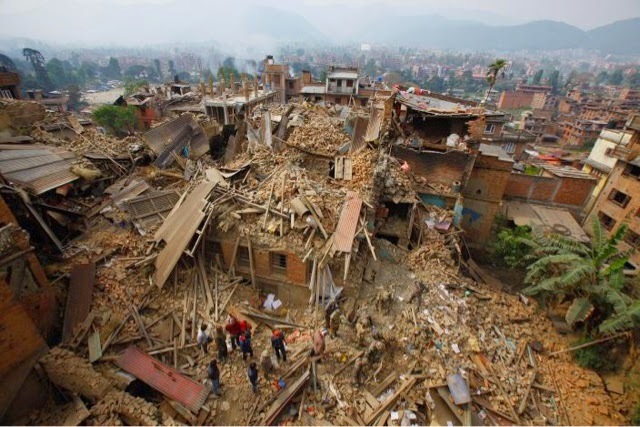 Thousands of houses have been destroyed in the mountainous districts of Nepal while Voluntary organizations from within Nepal and outside Nepal are serving the affected, together with Nepal and Indian Army, International NGOs are all involved in serving the people. Several Mandirs & Muths and heritage buildings of archaeological importance have been destroyed in different parts of Nepal including Kathmandu. These include Patan Krishna Mandir, Patan Darbar Square, Basantpur Hanuman Dhoka Darbar square, Bhaktapur Darbar square, Taleju Mandir. The loss of historical and culturally important Bhimsen Dharahara 9storey tower is probably the worst loss. The volunteers of Hindu Swayamsevak Sangh Nepal, Jan Kalyan Pratishthan Nepal, Pashupati Shiksha Samiti, Pragyik Vidyarthi Parishad Nepal, Vishwa Hindu Parishad Nepal, Janjati Kalyan Parishad Nepal and Sewa International Nepal swung into the rescue and relief work just 3 hour after the devastating earthquake which struck Nepal. They started distributing drinking water, rice, Chiwda (beaten rice), snacks and tarpaulins as an immediate relief in many places of Nepal. Since then the relief material is being distributed for last 3weeks by in all the 12 badly affected districts of Nepal like Kathmandu, Bhaktapur, Lalitpur, Dhading, Kabhrepalanchok, Nuwakot, Rasuwa, Dolakha, Gorakha, Ramechhap, Sindhupalchok & Lamjung. In some of these districts 90% houses have been destroyed by the earthquake. The volunteers have tried to reach far flung villages in some of these districts which are located at high altitudes like 10000+ feet to provide relief material to the people in distress. There had been a demand for Tarpaulins for protecting the families from rain/wind/sun and foodstuff like rice & yellow gram (Arhar) which are being supplied. HSS led organizations have successfully deployed more than 1600 Volunteers for the rescue & relief operations till now and have reached more than 300 villages till this date in those 12 districts of Nepal. Villages in Nepal comprise of some hamlets together. 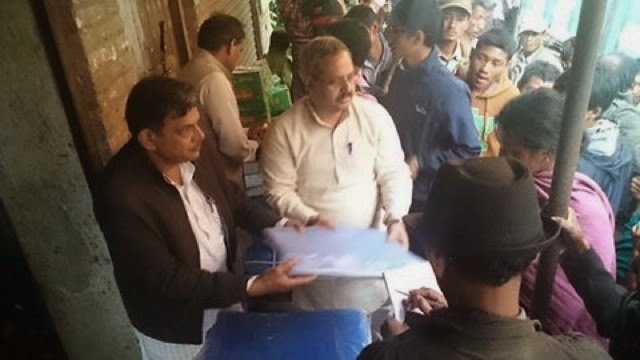 More than 200 Tons of relief material like Tarpaulins, Rice, yellow gram, edible oil, tents, biscuits, have already been distributed till this date. 50 Tons of material is awaiting transportation from Bharat. Timely valuable guidance by visiting dignitaries like Ma. Dattatreya Hosabale and Shri Sunil Ambekar, who spent 5days in Nepal and even participated in relief, boosted the morale of all Swayamsevaks and oriented the activity in appropriate direction for serving the quake affected. Sewa International Nepal appreciates the support and cooperation of many local organizations from various towns & villages of above mentioned districts in considerable strength in the relief operation. These local organizations provided a better lead to the remotest areas in some of the affected districts. 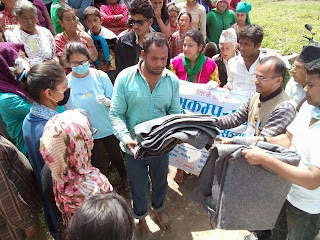 Sewa International Nepal thanks the people of Bharat for rising to the occasion and sending the relief material on massive scale through Sewa International Bharat and Rashtriya Sewa Bharati which took pain to deliver the material on time and continues to send even now. Sewa International Nepal is thankful to all Sewa International units and volunteers across as many countries for timely and instant response and support in many ways. 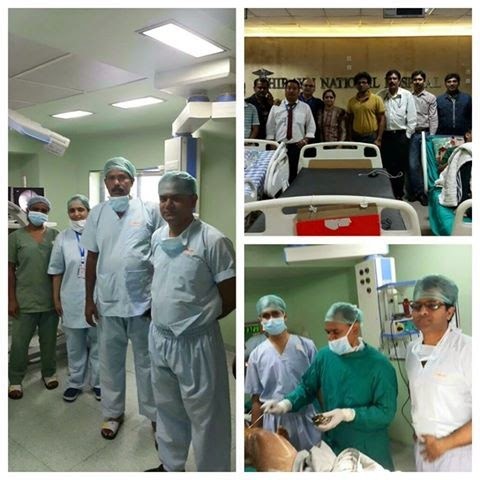 Sewa International Nepal appreciates the role of Indian Embassy in Kathmandu for providing round the clock services to the earthquake affected in Nepal which is appropriate. Sewa International Nepal will also like to thank team of Doctors from Arogya Bharati, National Medicos Organization and many individual groups who joined the relief with medicines and medical kits that have saved many lives.Sewa International Nepal in coordination with HSS and other partner organizations in Nepal, is planning to take up some short term rehabilitation program soon after concluding the relief operations keeping in mind the ensuing monsoon. Providing a temporary kind of roof is essential like Tin sheets and structure to support it. The students community is worst affected and they would be provided support for their education immediately. Sewa International Nepal would decide on the long term rehab for the benefit of the earthquake affected soon. Sewa International Nepal looks forward to international support in course of time for the long term rehabilitation program. Â·Â Â Â Â Â Â Â Â TarpaulinsÂ Â Â Â Â Â Â Â Â Â Â Â Â Â Â Â Â Â Â Â Â Â Â Â Â Â Â Â Â Â Â 20759 Nos. Â·Â Â Â Â Â Â Â Â BlanketsÂ Â Â Â Â Â Â Â Â Â Â Â Â Â Â Â Â Â Â Â Â Â Â Â Â Â Â Â Â Â Â Â Â 25152 Nos. Â·Â Â Â Â Â Â Â Â Yellow gram (Daal)Â Â Â Â Â Â Â Â Â Â Â Â Â Â Â Â 915 kgs. Other materials distributed- Water bottles, mats, Candles, Torchlights, Matchboxes, Umbrella, etc.